Lets talk a bit about how the ski-swap buying process actually works. So this post is aimed at the novice ski-swapper looking to outfit a family with skis, boots and poles for the first time. I am certainly not an expert on ski gear, but I have a few keys for success that I can share with you. Shopping list is a must! Take an inventory and figure out what you need. There is going to be a lot of commotion at the swap with lots of buyers rooting through the gear. So make a list to avoid confusion. 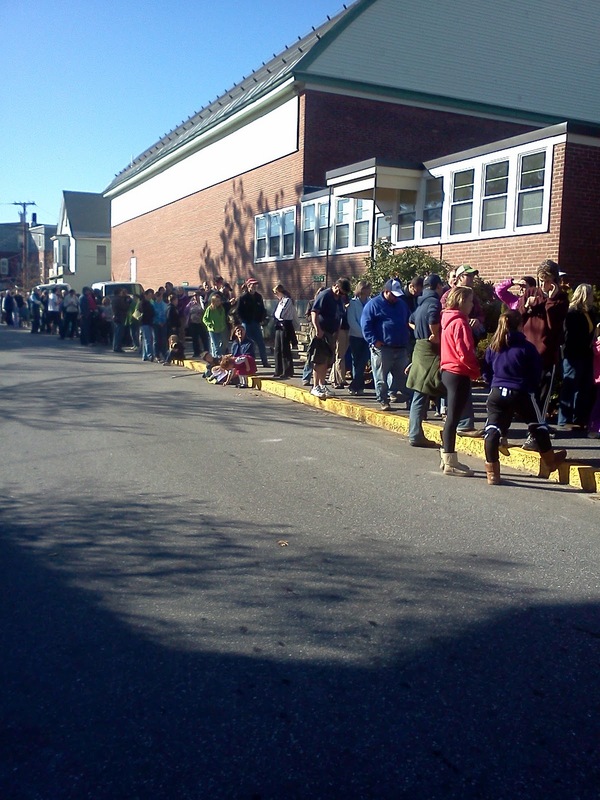 If you want the best shot at the best used gear, arrive early and get in line. Its a drag but the line is going to start forming a couple of hours before the swap. If you arrive an hour after the swap is over it is too late - all the good gear will be gone. I usually try to arrive before the swap in the 45-60 minute window which puts me mid-line usually. They open the ski swap doors and the people rush in. I will not lie - it is mayhem during the first 30 minutes of a swap. It compares to a bunch of shoppers trying to get the hot new Christmas toy the day after Thanksgiving. Be prepared for lots of people and commotion. Thus it is important that you make your decisions quickly to get the best gear. Size - The ski should reach to about your nose when standing on end. To the forehead is fine for a more advanced skier. Chin-level for a beginner skier. Shape - A ski has 3 measurements, tip, underfoot and tail. Today's modern skis are sometimes called 'shaped skis' as the tip and tail are quite a bit wider than underfoot. The more shape it has, the easier and quicker the ski will turn. You will want a ski with some shape in it. Brand / Style - There are many different manufactures and styles and they change every year. So there will be quite an assortment in the racks. For the beginner / novice skier, stay away from anything that says "Race", "Giant Slalom", "GS", "Slalom" or "SL". These are race skis and will be much too big and burly for the starting skier. Try to get something that looks fairly current. Stay away from the big long narrow downhill skis you remember from your childhood. It is likely that these ski are too old and no ski shop will touch them to adjust the bindings. Brands we like are Rossignol, Volkl, Line and Dynastar but there are lots of good brands out there. Price - You should be able to pick up a current entry level adult ski from anywhere to $75-$125. 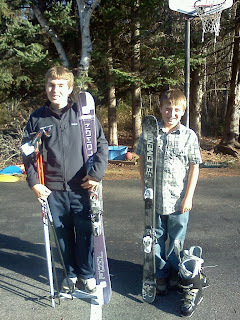 A good junior ski should be in the $50-$100 range. You might be able to get a better deal than this but this is a good place to start expectations. There should be a bin of used poles at the swap. Take a quick look at the pole to make sure the straps are in place and that the pole is not bent. Sizing the pole is pretty easy - just do the following. Flip the pole upside down and grab the pole under the basket. With your elbow next to your body, extend your forearm out at a right angle and place the handle of the pole on the ground. At this point, your forearm should be parallel to the floor. If your arm is pointing up, the pole is too tall, and vice-versa. You should be able to get a set of good used poles in the $10 range. I often buy two sets in case they get broken, lost etc - because late season it is hard to find replacement poles. Boots are the hardest thing to get at a swap - and it is probably the most important piece of gear you need. A bad fitting boot makes for a miserable skiing experience. Boots have this strange mondo-sizing number stamped on the boot. A mondo-size of 25.5 equals and 8.5 US Mens. (Here is a helpful conversion chart.) It is also really hard with kids because you can't feel the toes inside the boot so you are not sure if the child is really telling you the truth when you ask them if the boot fits. I sometimes recommend folks to visit a ski store or a second hand store like Play it Again Sports to find a good-fitting boot. (The Portland, Maine Play it Again store has a particularly good ski section) The staff is typically helpful and it is worth it to spend extra money to find a boot that works. Regardless of where you purchase the boot, here are a couple of boot fitting tips. Make sure the boot has 3 or 4 buckles in the front. Rear-entry boots (with the buckle in the back) are old and don't provide much support. Take a look at the boot liner and make sure it is decent shape. You can take the liner out of the boot and inspect it. The boot is going to be snug when you put it on, and your toes may even touch the front a bit. The important part is that when you crouch down in a skiing position, your heel slides back into the heel of the boot and the tongue / buckles of the boot provides good resistance. If the forward shin pressure collapses the front of the boot then you will have less control over the ski. Boot prices vary widely. $25-$75 is the range for most entry-level boots at ski-swaps. Expect to pay more at the second hand store. Most ski shops sell used boots as well at a higher price point. There are lots of boot makers out there, but our family has pretty good luck with Head ski boots. There is lots of other gear you can look for at a swap like Helmets (a must for warmth and safety! ), Gloves, Jackets, Ski Pants and Goggles. If you don't find any of these items at the swap don't sweat it too much. There are lots of places on-line and in the local area where you can pick up these items at a reasonable cost. One other tip - if you have a smart-phone or other mobile computing device - google it! If you google the ski name and brand, you typically come up with sites reviewing the ski or at least providing more details on the type of skier the ski is designed for. Take your boots and skis to a reputable ski shop and have the bindings adjusted and tested! This is not a job for the un-trained. A properly adjusted binding keeps your boot engaged with the ski, and is designed to release when you fall. If you are 100lbs and the binding is adjusted for a 225lbs person, you are risking serious injury! I take my skis for adjustment to Freeport Ski and Bike, but there are quite a few ski-shops around that can do this service. Expect to pay $20-$30 for a binding check and adjustment and another $20-$30 for a ski tune-up. However, tuning your skis can be an at-home money-saving activity. Learn how to tune and wax your skis with my instructional videos! I hope you find this post helpful! Feel free to comment if you have other ski-swap suggestions. 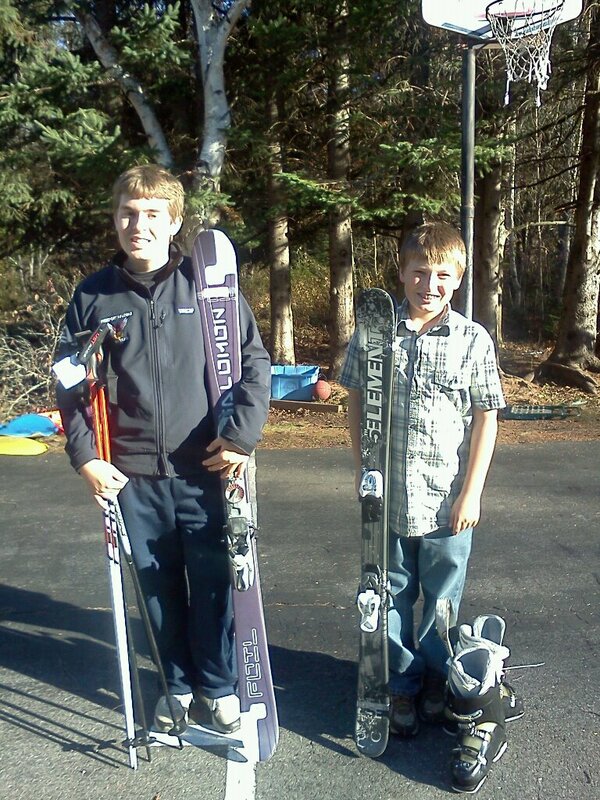 I am planning on going to my first ski swap this year to get equipment for my family. This post was extremely helpful. Thank you! Wow! I wish I had had this information at our first ski swap last year. BUT, we were lucky enough to be greeted right away by a volunteer who led us around (dumbfounded as we were) by the hand, showing us good equipment at amazing prices. She grabbed up what we needed, and got other volunteers to help with various pieces. Standing in the check-out line with an over-eager 11 year old may have been the most painful part of the process! We got a late start this year, but still have high hopes of outfitting FOUR kids before the snow (really) flies. Thanks for the very helpful tips!